Coastal climbing, both bolted and trad. Short routes (8-15m). All year round climbing, amazing views and has the benefit of beautiful swimming if it gets a little warm! The rock is not the most stable in the world so helmets are advisable. Scope for more 1st assents for those who are willing!! Coming from Nelson, take the main road north following signs for Picton. Just before Hira take the left, signposted Cable Bay. Eventually you'll arrive at the bay, park at the left end of the beach. The climbing is located on the left side of the bay looking out to sea. At low tide you can walk along the rocks, high tide means a short detour over the hill. After 5 mins the 1st slab is reached. About 14m high and 15m wide. Further round is the next area of climbing, reached easiest at low tide, with some of the climbing only accessable at low tide. 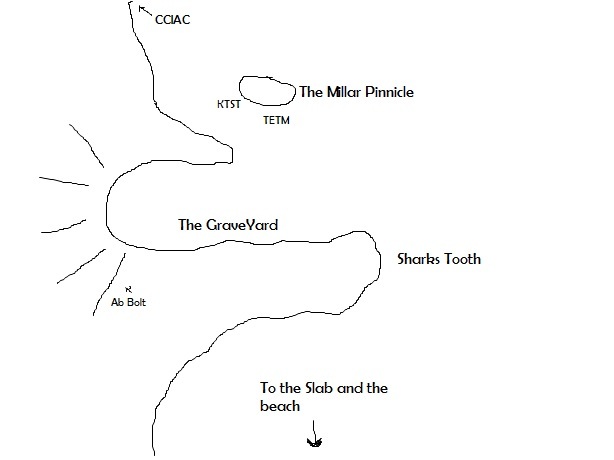 The Sharks Tooth is the obvious feathure to aim for, sticking out over the sea. Beyond this is the Graveyard. Reached by gaining the top of the headland that has the Sharks Tooth on the end, and abseiling down the other side. A single bolt (age??) can be found on the far side, furthest away from the sea. It's suggested that this is backed up and an in-situ rope left, as once in the graveyard, the only dry way out it to climb. If kayaks are available, this is by far the best option, as its quicker, you can paddle straight into the Graveyard bay and leaves you with a bit more time to climb. Further along still is the free standing Millar Pinnicle. the southern end of the Millar Pinnicle, climb the black slab to a large spike, then the bold slab above. The obvious dark well protected corner.